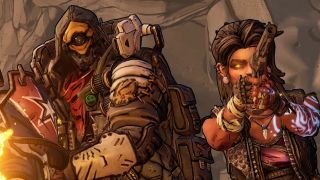 Time to get your Mr Torgue caps on: BORDERLANDS 3 SPLIT SCREEN IS COMING! That cheering you can hear is the sound of gamers everywhere rejoicing, as being able to play the previous games in split screen mode made for perfect local co-op shenanigans and is still a massive reason why people love the games now. Borderlands 3 split screen being a real thing means that you can now start gathering a group of buddies to play with, and yes, I might have already sent out a flurry of messages to my own. Because if there's one thing better than exploring Pandora and Borderlands 3’s other worlds solo, it's exploring them with a buddy. Split screen has seen a bit of a resurgence in the last year after A Way Out came out, as with the rise of online co-op there was no need to divide up screens as people weren't playing the same game, in the same room, on the same screen. Cue gamers mourning, as the cherished memory of having friends over for a gaming session quickly became something of a nostalgia trip. But now the fact that there's Borderlands 3 split screen proves that Gearbox hasn't forgotten its roots, nor the fact that most of their loyal Vault Hunters delight in playing Borderlands with buddies in real life. Now if you'll excuse me, it's time I got my living room prepped for a joint gaming session and blew the dust off my spare controller. Due to come out on September 13, 2019, you won't have to wait very long to engage in co-op escapades yourself! Our Borderlands 3 trailer breakdown has more details about the game that you might have missed, or glance below to see all the little details we found in the teaser trailer!